Now I don’t want to jinx anything just yet but I seem to be on a bit of a roll when it comes to Youtube videos. I’m trying to upload one video per week and so far, I’ve stuck to it, plus I’ve already got one ready to go for next week. 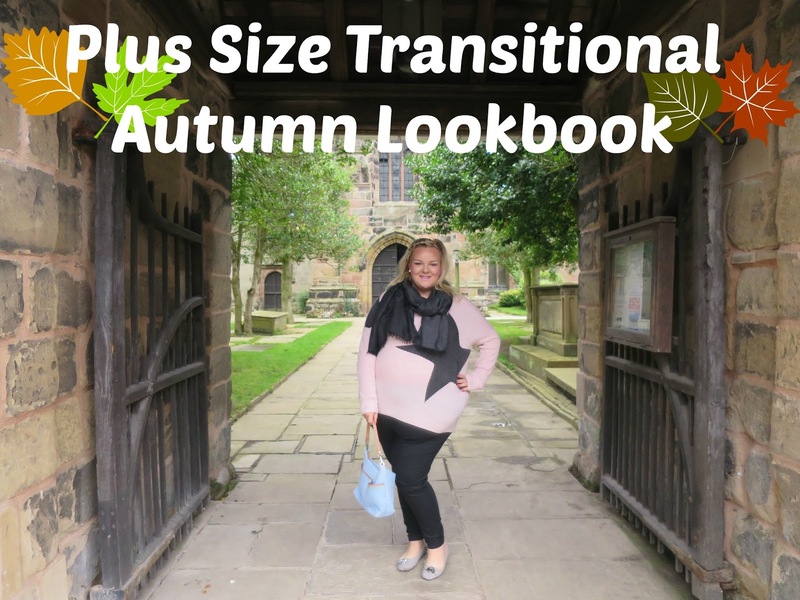 My latest video is a plus size transitional autumn lookbook. I’m going to be doing quite a few outfit videos but they’re designed to show you what I wear day to day rather than to show you whats in the shops now. That’s because I don’t actually buy a lot of clothes too often, or at least I don’t buy full outfits that much. I’d thought about saving my clothes until I had enough to make a full video of new things but that could be months away, if ever so I thought that these videos could serve as inspiration more than anything. Funnily enough, I say that but theres quite a few new in things in this video and post, mostly because I did a little bit of shopping at the Yours Clothing store opening that I went to which you can read about here and I picked out autumn appropriate pieces. I have A LOT of summer appropriate clothes but my autumn and winter stash is pretty thin on the ground. This first outfit is very casual. I wore it on a road trip recently with Mr WLL. It centres around this Navy and Pink Checked Boyfriend Shirt* which I got in a couple of sizes smaller than I would usually get so that I could wear it open as more of a light jacket. You could of course buy your usual size and wear it buttoned up with the popper fastenings but I find shirts can feel quite restrictive on me. Plus as I’m so much larger around my middle compared to my shoulders and bust, if I were to buy a shirt to fit my tummy, it would be far too large on the top. Wearing a shirt open with a white vest top underneath enables me to still wear this American flannel shirt inspired style but in a way to suit me. I love the brushed, soft fabric which makes this shirt comfortable and warm to wear as well as soft against my skin. The great thing about this shirt is that it doesn’t crease which makes it perfect for travelling as you can fold it up to pop into your bag when you’re too warm or don’t need it and you can easily pull it back out to wear or pop over you as a blanket without it being creased. I paired it with my favourite denim leggings that I’ve been wearing for years because they look great and they’re so comfortable to wear. These are a staple in my wardrobe that I can’t see myself being without! My shoes are the Converse All Star White Mono Leather trainers that I customised myself for a special occasion by swapping out the laces for white ribbon and crystallising them. 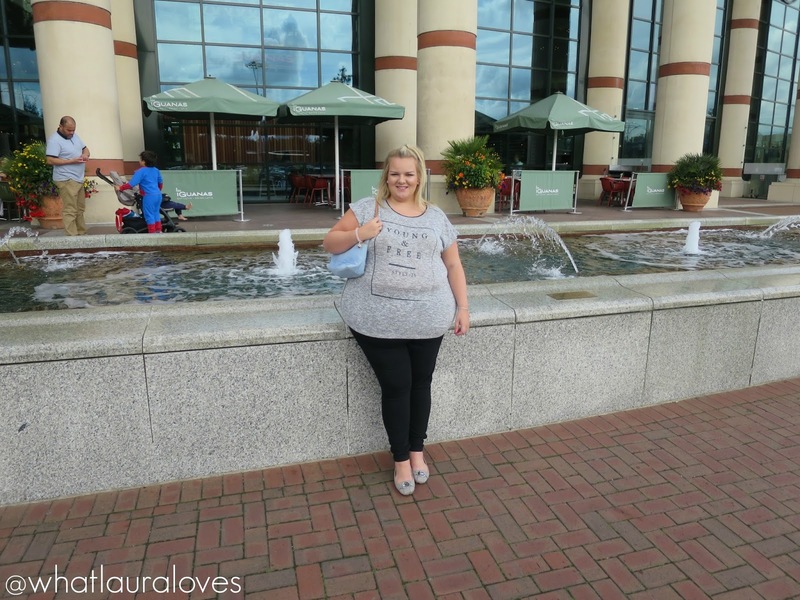 When I’m going out shopping, I like to wear something comfortable and casual, so for a trip to the Trafford Centre, I picked out my staple black pull on jeggings with the grey marl slogan top that I reviewed here to wear. My shoes are the Michael Kors Fulton Moc Flat Slip On Loafers in grey with silver hardware which I think compliments the grey of the top really well and ties the outfit together. My bag is by Ralph Lauren. I got it years and years ago on a school trip to America and it is still going strong. I love the pale blue colour and think that it looks great alongside the grey. For jewellery, I’m wearing the same bracelets as the previous outfit. 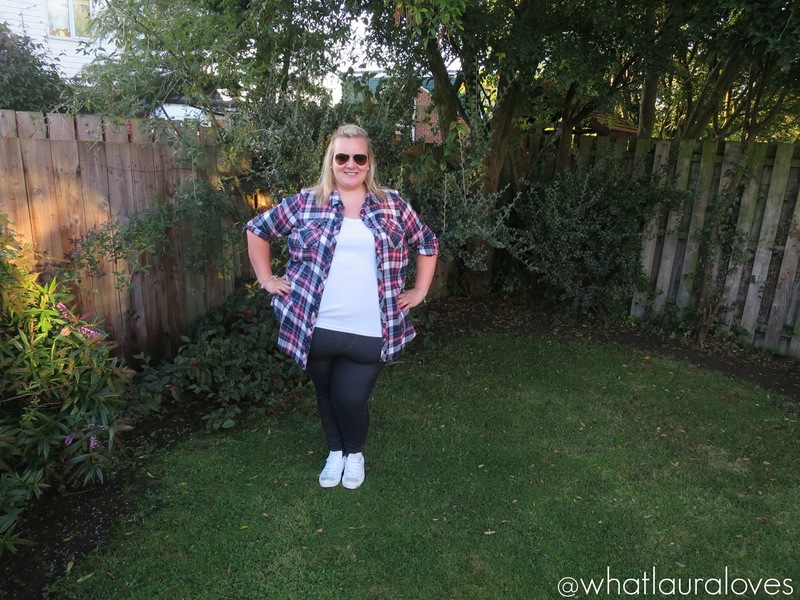 You’ll see them featured a lot in my outfit posts as I they’re some of my favourites. I kept my black Gucci scarf in my bag and popped it on later when I was cold. 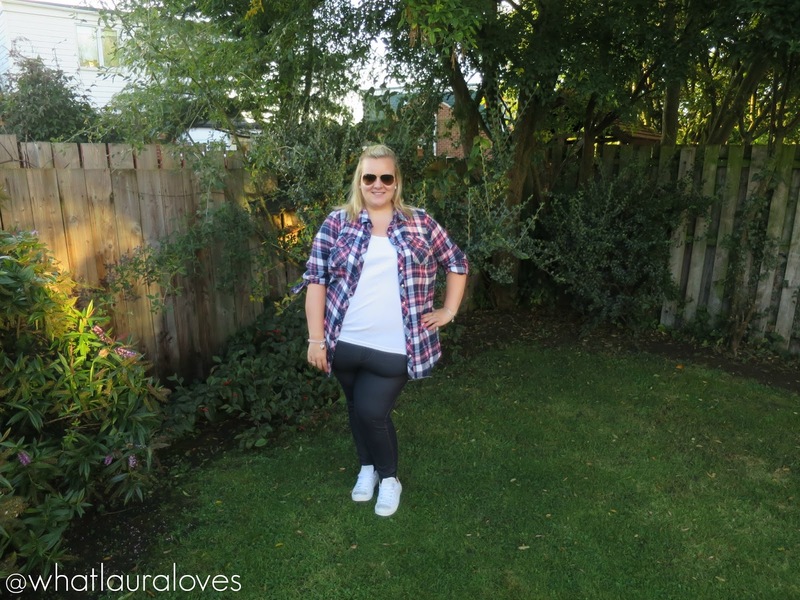 The late summer and early autumn days are quite unpredictable in the UK as some days are very much hotter and sunnier than others but what I love about this weather is that it is usually still warm enough to go out without wearing a coat. Choosing transitional pieces in your wardrobe can enable you to enjoy your clothes now, but still wear and enjoy them by layering them up with other items once the colder weather sets in and you’re having to bundle up in a thick coat and wooly accessories. 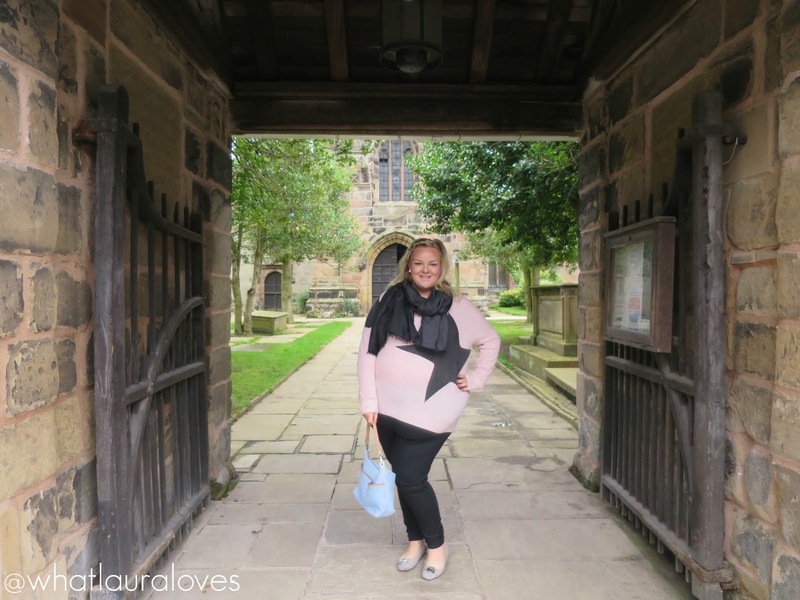 This next outfit is one that I wore out for lunch and a wander around a village in Cheshire. My pink jumper from Yours Clothing* is light enough to not feel bulky or to make me too hot on a sunny day but its thick enough to keep me warm should the sun pop behind the clouds. I love the wool mix fabric as it is so soft against the skin and not itchy at all like some jumpers can be. The dark grey/black stars are embellished which can’t be seen from afar but look lovely when you’re taking a closer look at the jumper. The length on this top is great too as it is long enough to cover your bottom, should you want it to, or you can wear it pulled up a little and slouchy for a more relaxed, casual look. I’ve paired the jumper with my black jeggings, Michael Kors flats, Ralph Lauren and Gucci scarf. While the MK shoes and Gucci scarf were by no means cheap, they’re pieces that I’ve worn countless times since I got them and they’re still looking as good as new. I’m so pleased that I saved up to get them as they’ve definitely been worth it. This next outfit is one that I wore out for dinner and drinks with my friend Katie who writes the blog Katie Jane Online. It features my staple black waterfall jacket which was another purchase that I made earlier this year that has been well worth it. It was very affordable but has stood me in good stead all these months and has washed so well. 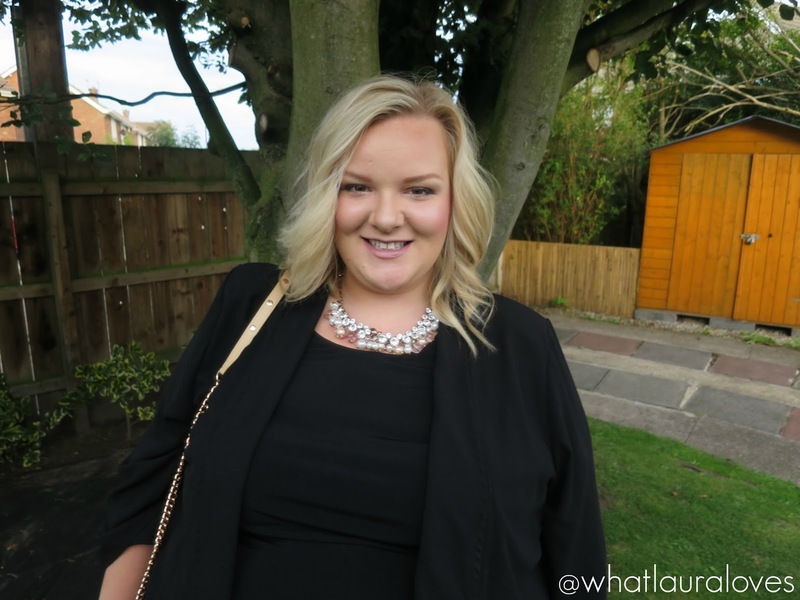 The top that I’m wearing underneath is the Fashion World Cold Shoulder Top that I first reviewed in this post all about work wear. It isn’t available anymore but there are so many similar ones available online. Cold shoulder tops seem to get a very mixed reaction in the plus size fashion community but I don’t mind them too much at all. Especially when paired with my Happiness Boutique Pearl and Diamond Statement Necklace* which I really think sets it off nicely. 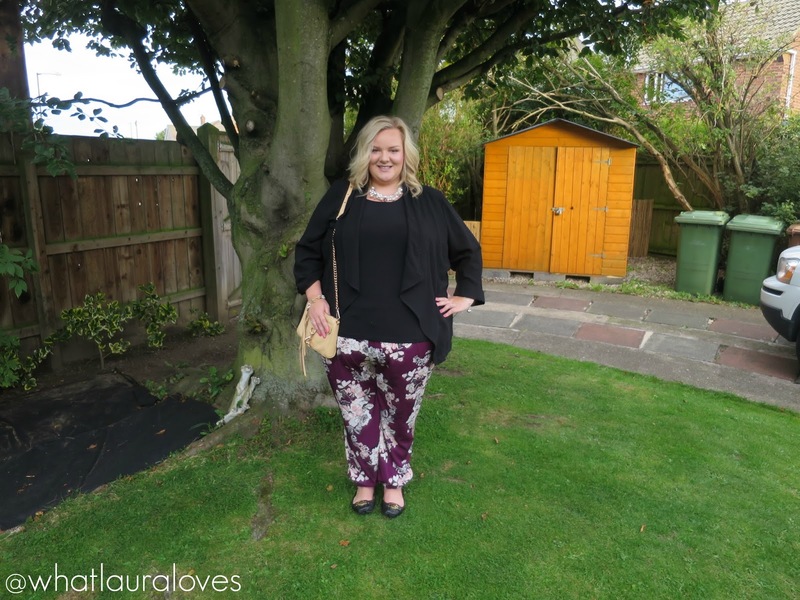 After keeping things plain and simple on the top, I wore some printed trousers on the bottom. These were a sale buy at the beginning of the year but theres plenty of printed trousers available this season too. 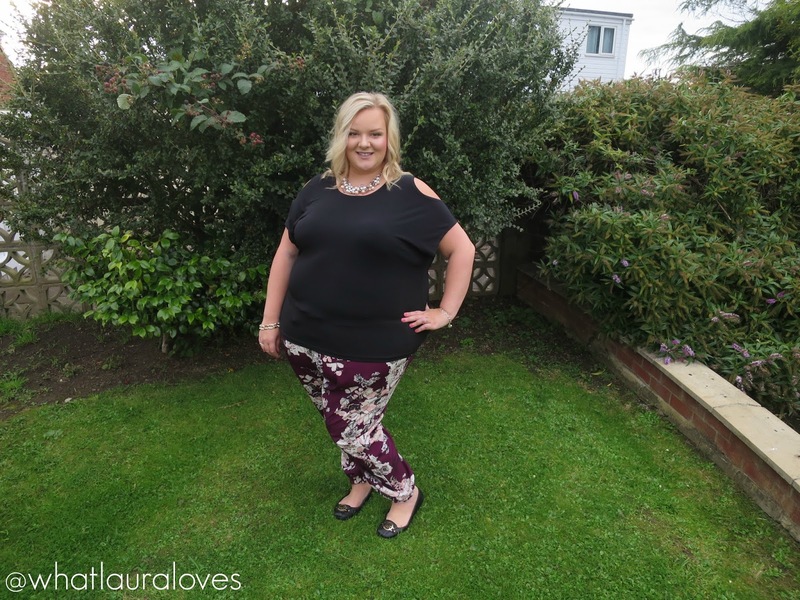 If you’re looking for plus size printed trousers then I’d highly recommend Yours Clothing, its where I get all of my printed trousers from as they have some great designs and are very affordable which is what I’m looking for in a piece that I might not be wearing in years and years to come. Here is a closer look at my Happiness Boutique necklace. I’ll be reviewing it in full on my blog very soon but if you want a sneak peek of my thoughts on it… its FABULOUS. I will DEFINITELY buy some statement necklaces from them in the future. My shoes are the black with gold hardware version of the Michael Kors flats that I’m wearing in the other outfit pictures and my bag that I’m sure you’ve seen one hundred times, is the Rebecca Minkoff Mini Mac in Biscuit. 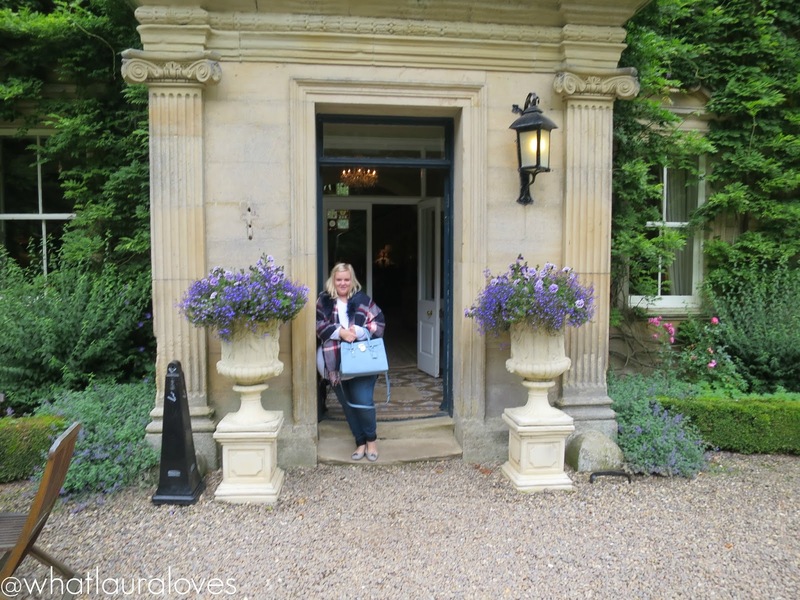 The final outfit in this video was actually what I wore during the day on my birthday this year when we were at Eshott Hall. 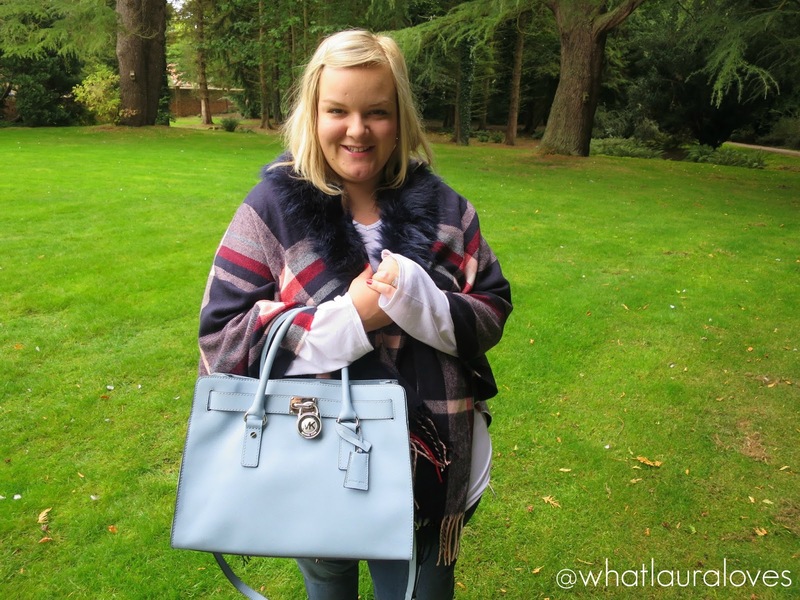 We also went to the cinema that day and it was a little chilly inside so I was really grateful that I’ve received this gorgeous River Island cape for my birthday. I love the navy, red and pink colours in the tartan as I think that they look great together and stop the tartan from looking too traditional like red or green tartan can. The tassels on it are so cute, as is the faux fur trim which looks gorgeous in blue. The fur trim is actually detachable as it is secured with little buttons but I can’t see me taking it off as I love the feature; it really stands out compared to the other capes that I have. This piece is a great transitional item as you can really snuggle up in it when its cold and wear as many light or thick layers underneath it as you like. I just have a lightweight, oversize top from Boohoo on with my grey MK flats and my new ASOS jeggings which seem to be far longer in the leg than my black ones, despite being exactly the same, which is why I’ve turned them up at the bottom. The bag that I’m carrying is my gorgeous powder blue Michael Kors Hamilton that I actually received for my birthday last year. I don’t usually carry large bags as I never take much out with me but this one is really structured so although I don’t have much in it, it still keeps its shape really well. I’d highly recommend this bag, especially if you’re someone who carries a lot of things with them, perhaps to work. It even works well as an overnight bag if you’re not taking everything but the kitchen sink with you. I hope that you’ve enjoyed seeing my autumnal outfits. They’re mostly casual but I’m not really a party girl these days! If you could head on over to my new youtube video and give it a thumbs up, I’d really appreciate it. What transitional pieces do you like to wear at this time of the year? Outfits 1 and 5 have pretty much been my fall staples this year. I do really love look 4 too. You are always so fashionable and you pair clothing/colors beautifully! I wish I could do that in my wardrobe! Thank you for some inspiration! !